This post is sponsored by JoAnn, but all opinions are all me. Thanks for supporting the brands that support Love & Renovations! The Christmas season is officially in full swing, and I’m feeling behind. I mean, I know I have an excuse. 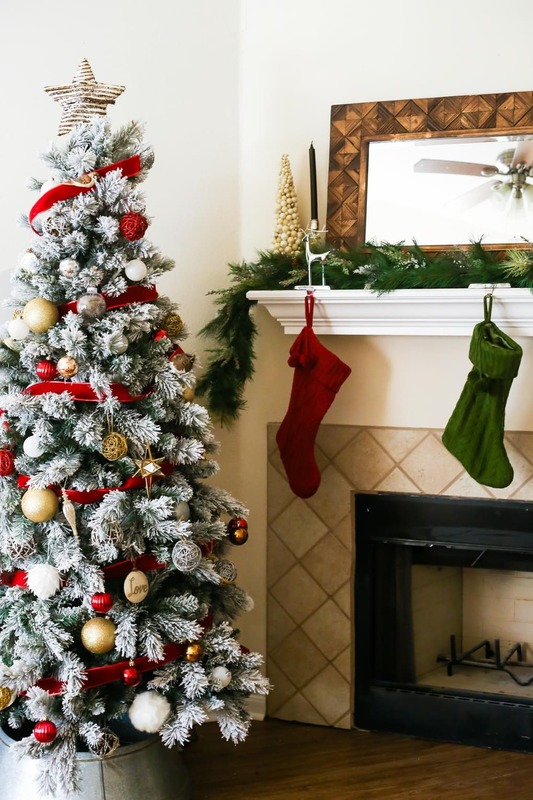 We just moved into a new house a couple of weeks ago, I still have moving boxes everywhere, and (unlike most years), Christmas has been one of the last things on my mind lately. 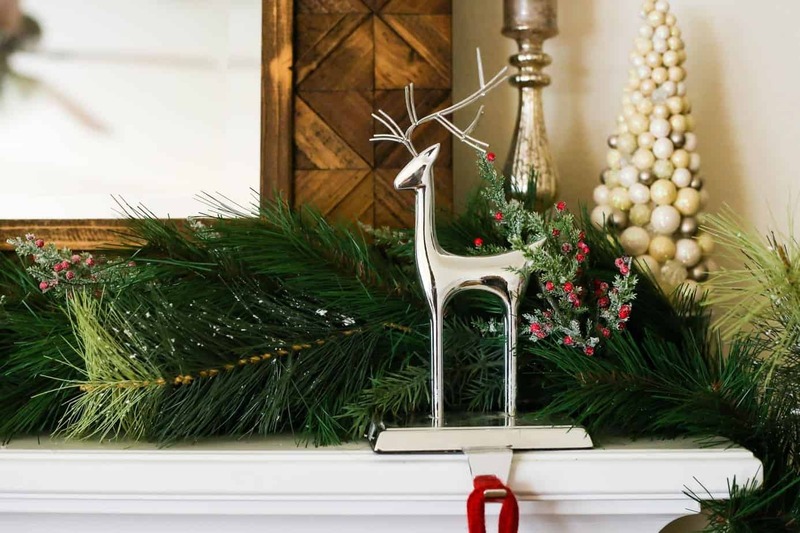 But, despite my ever-so-slightly-Grinchy attitude right now, I’ve really been wanting to get myself in the Christmas spirit – and one of the things that never fails to make me feel pumped about Christmas is doing a bit of crafting. So when JoAnn asked me to create some holiday decor from my home using products from their store, I was so excited to have an excuse to get my craft on. 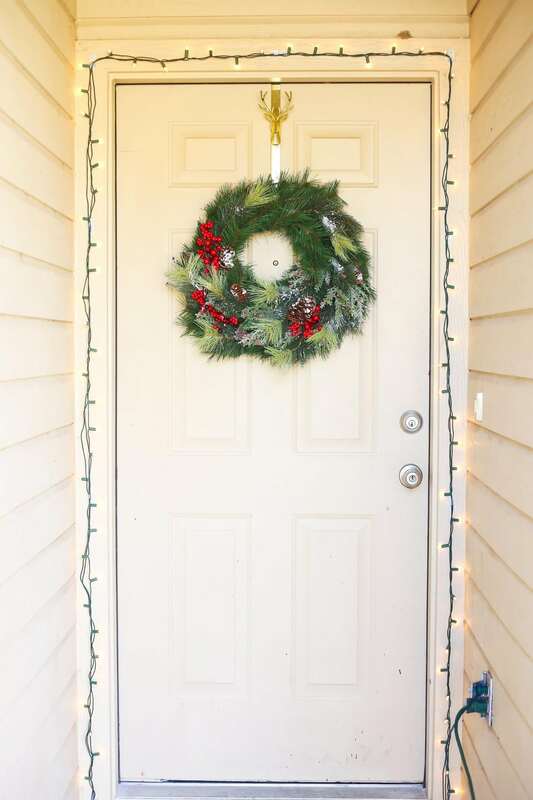 I decided to make a wreath for our new front door – it’s the first thing we see when we get home each day, and we’re currently doing everything we can to make this still-kind-of-strange-to-us house feel more like home. So, a new wreath felt like the perfect way to make things a little more homey and get myself feeling a little more Christmas-y at the same time. 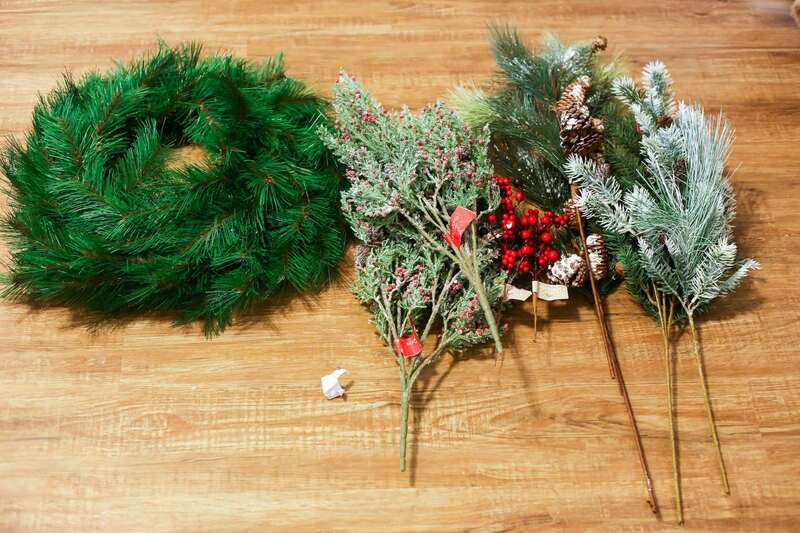 I don’t know about you, but I like my wreaths simple. 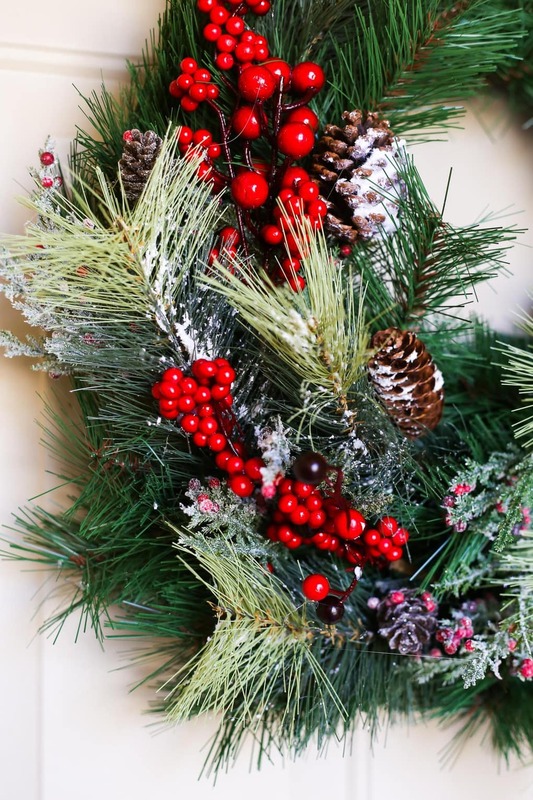 I mean, don’t get me wrong – a big, beautiful wreath with tons of ribbon and bows makes me smile just as much as the next person, but when I’m picking out or creating wreaths for my own home, I’m drawn to lots of greenery, a little bit of color, and not much else. What can I say? I like a mostly naked wreath. I mean, ignore the off-white front door and the yellow-ish trim and the doorknob that doesn’t really work and the lack of anything else even remotely fun to look at. Just look at the wreath, kthanks. When I got to JoAnn, I was super excited to find that basically everything I was planning on purchasing was on sale. Shopping is just more fun when it’s 50% off. It’s science. They had a ton of gorgeous options for wreaths – if you don’t want to do the work yourself, they have some beautiful, finished wreaths (I particularly like this one and this one) – I chose one with long needles, which I think looks a lot more realistic than other textures, along with several different floral sprays to add some more color and texture. 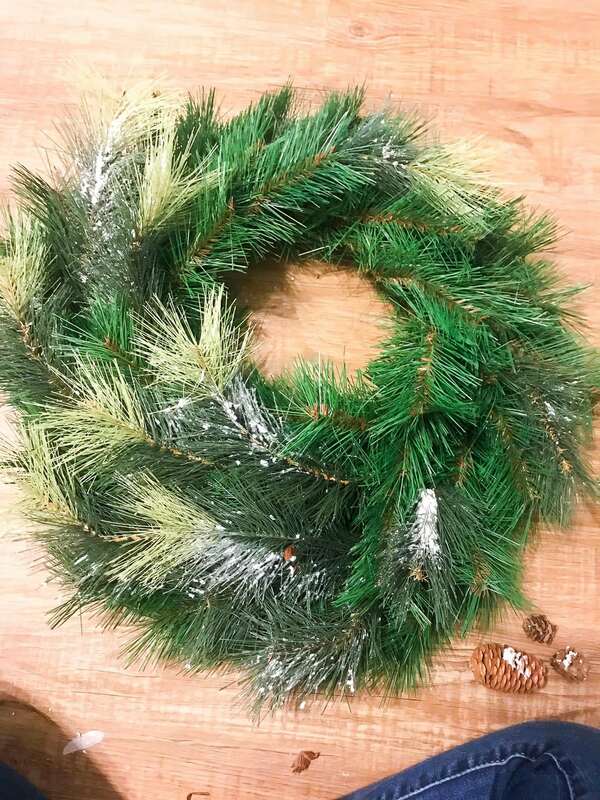 As soon as I got home I grabbed the wreath and my hot glue gun and got to work – I could feel the Christmas spirit coming back already. Most of these florals are made with wire, which technically means you could just wrap it around the wreath or garland to attach it, but I like to be sure everything is nice and secure. 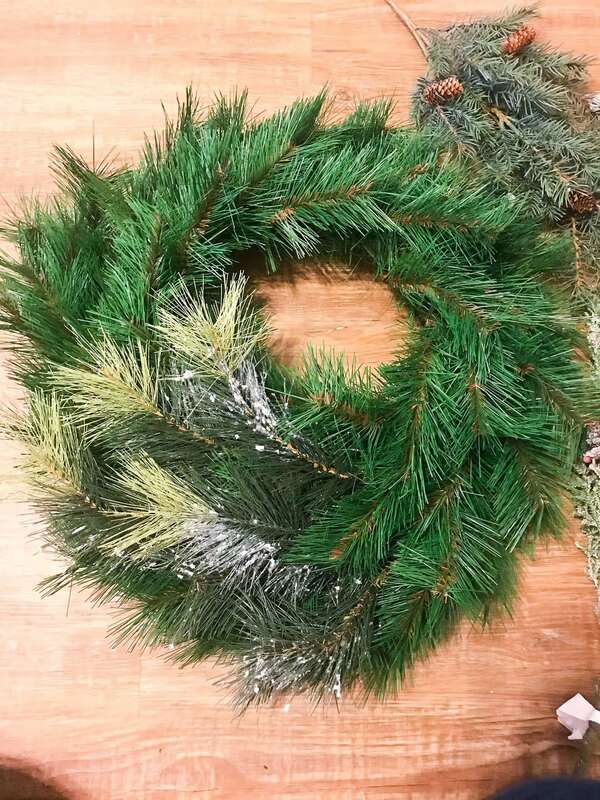 The last thing I need to worry about this season is a falling apart wreath, am I right?! I have more important things to worry about. Like the fact that I can barely open our front door because the knob is broken and our bathtub is drippy and the microwave only works about 40% of the time. What were we talking about? Oh yes, the wreath. 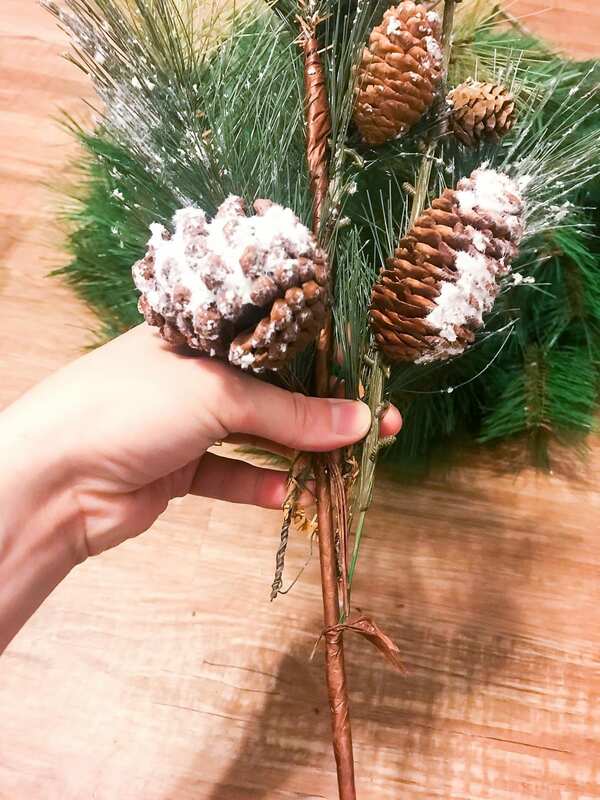 It’s really easy to take the floral sprays apart – they’re wrapped with floral tape, so all you have to do is take some scissors and cut the tape off, then pull the individual pieces out. It helps you spread everything out a little more evenly and prevents any one area from getting too full. 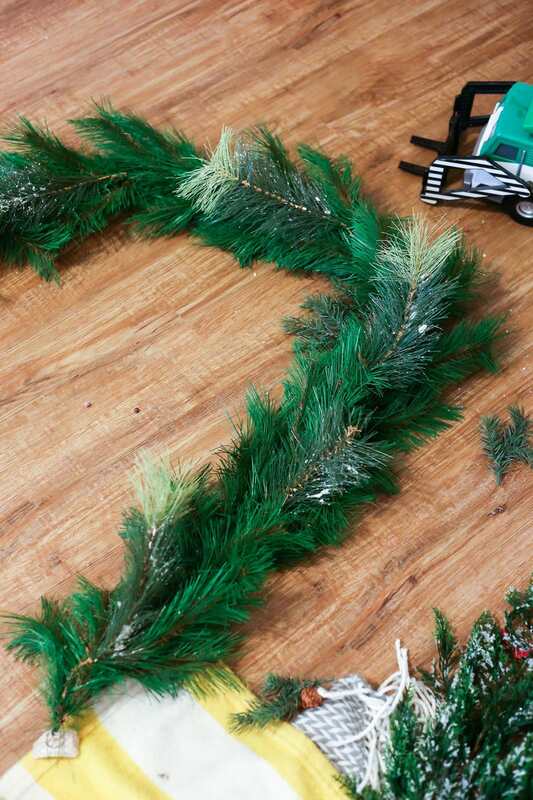 Once you’ve got your sprays pulled apart, just grab your hot glue gun and attach the individual pieces to the wreath. Once I had the base of the wreath done, I added a bit of color and texture with some berry picks and the pinecones from the sprays I used earlier. There’s no science here – just play around with it until you find what you like. Then STOP. That’s the hardest part – the knowing when to stop. Sometimes I’m good at it. Sometimes I’m not. This time, I think I stopped at just the right point – it’s full, but not too full. It has some color, but it’s still nice and simple. Basically, it’s just what I wanted. Our front entry (clearly) still needs a bit of a makeover. We haven’t painted the front door yet (I’m still debating colors! ), and I still need a new Christmas doormat and maybe a few other accessories. But for now, this little wreath and the Christmas lights are doing a lot to make coming home feel a little more cozy and welcoming. It was pretty and had a good texture, but was a little skimpy and needed some more varied color throughout it in order to look more realistic. And then I added some berries and a few pieces from other random sprays I picked up to finish it off. Then, I just laid it across the mantel and decorated around it a bit. 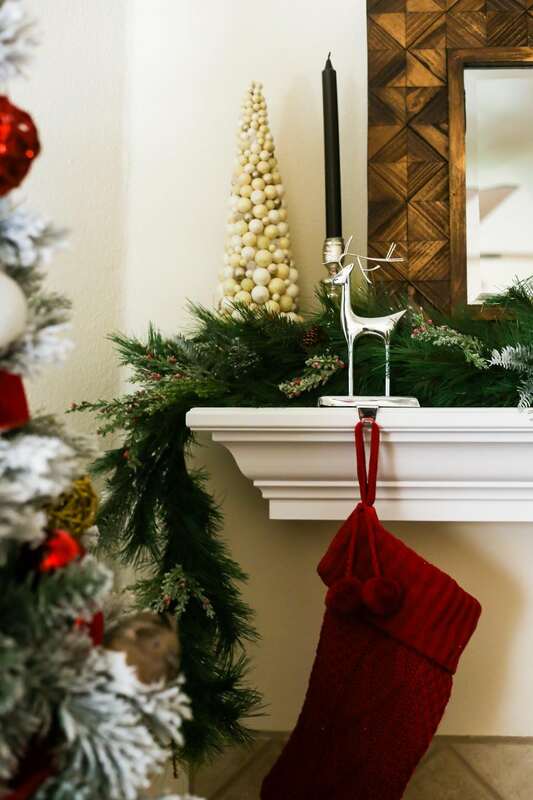 This is a perfect solution for a mantel where you have to keep things relatively low-lying – we’re planning on hanging our television above the mantel (as soon as I paint the walls), so I need my mantel decor to be beautiful without being too tall – this adds so much to the mantel without taking up too much visual space. I’ve really been gravitating towards darker and deeper colors in this home, and it’s been particularly evident in our Christmas decor. I’m drawn to deep greens, blacks, and other dark and moody colors versus the bright metallics and glittery decor I’ve used in the past. I’ll definitely still keep some of the shimmer going forward, but this house just seems to be crying out for some darker colors and a slightly different vibe than our last one did. I’ve been frustrated with some of our decor as I’ve brought it out to decorate this house, and I think it’s because it just doesn’t fit the feeling of this new home. 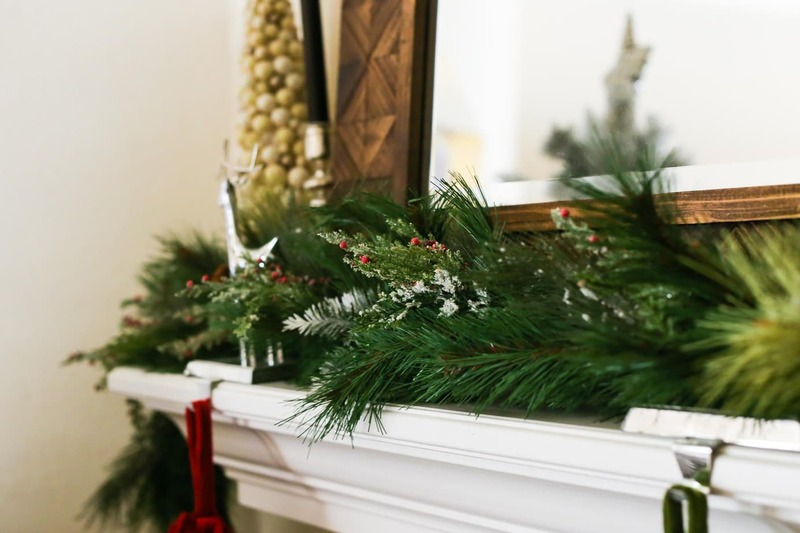 This new garland does so much to add some of those darker tones to the living room, and it really brings everything else together. Now that I’ve gotten a bit of Christmas crafting out of my system, I feel much more prepared to handle the holidays. We’ve been enjoying our activity advent calendar, wrapping gifts, and sipping on hot chocolate every time the temperature drops below 60 degrees. Here in Central Texas, you’ve gotta take what you can get. 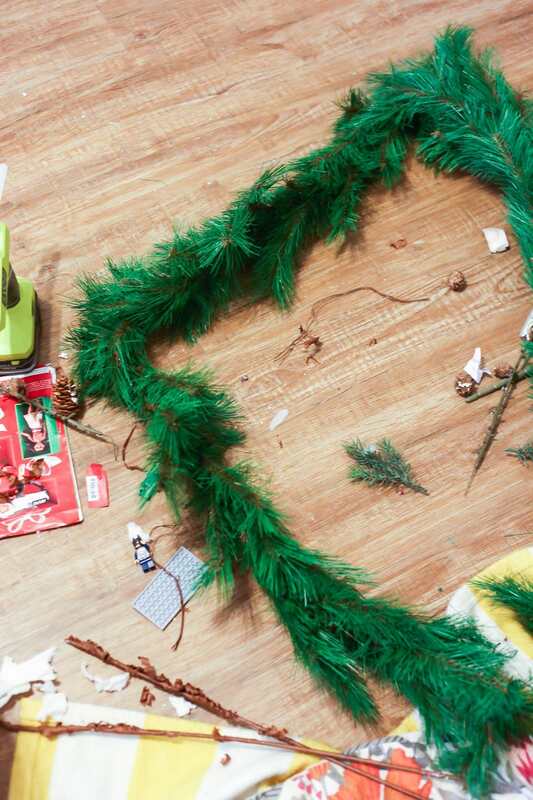 Have you done any Christmas crafting yet this year? It feels weird to not be doing nearly as much as I normally do, but I’m trying to embrace the simiplicty of this year – there’s nothing like moving to a new house the week before Thanksgiving that forces you to slow down a bit for the holidays! Or, at least, slow down as much as you can when you still have an entire house to paint, a zillion boxes to unpack, and a preschooler who asks every single day if it’s Christmas yet. It’s all so very pretty!! You do such a great job. 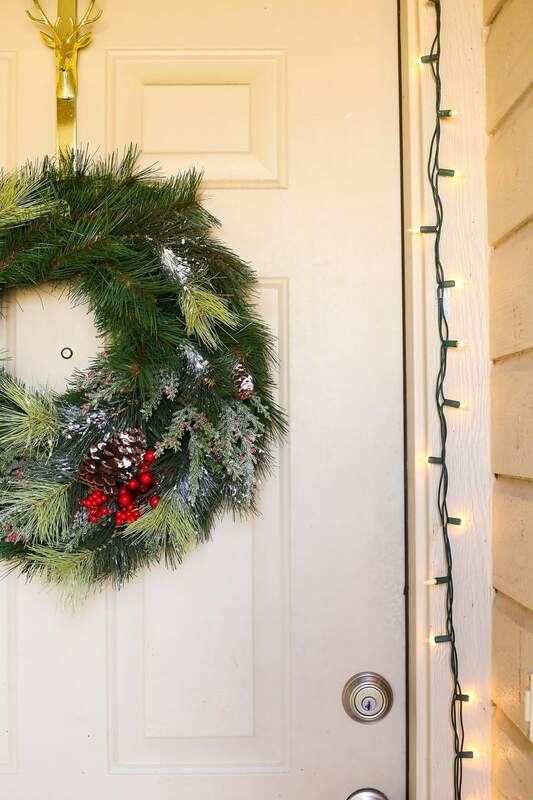 Can we talk about how ahhhh-mazing this wreath is? 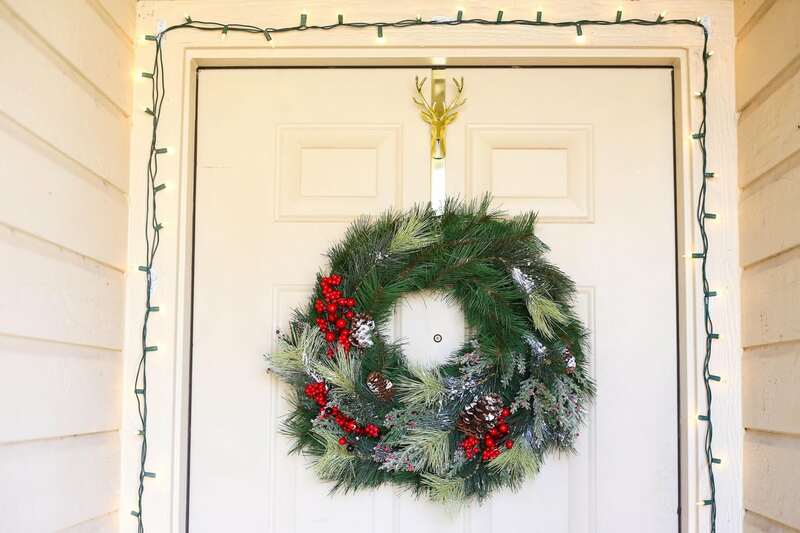 And the fact that you’ve decorated your front door with a handmade wreath after you just moved into your house?! YOU WIN. Looks sooo good! !